Need help with your garden? Here are some of our helpful garden articles to turn you into a real green thumb. What Plants to Plant in Autumn? Should I get my tree trimmed or cut down? Dead leaves smothering your lawn this Autumn? Do you wish you could turn your lawn into a low-maintenance haven where you hardly need to mow it? How about a garden where you don’t have to fight against weeds? It’s possible to get an effortless garden with different types of plants and gravel. In this article, you’ll receive 11 tips to transform your garden from a lot of work to a low-maintenance backyard. Unless you want to pave over your lawn—and maybe you do—it’s unrealistic to expect not to do anything with it. Instead of converting your lawn into a parking lot, you can install ground covers to replace your lawn grass. Ground covers are verdant, slow growing and hardly need any maintenance. Some ground covers also have small blossoms or oils that when stepped on release a heady fragrance. Here are 11 Exchange options for durable ground covers that don’t require mowing! 1. Selliera Microphylla: A native of New Zealand, selliera microphylla is a no-mow ground cover. It looks like lawn grass, but on closer inspection, it’s a succulent. Selliera microphylla needs to be continuously damp and planted in semi-shade. It’s also known as mountain selliera. 2. Mercury Bay Weed: Another native creeper, mercury bay weed (Dichondra repens) does well in some lawns. You can plant with seed or root cuttings. It’s prone to powdery mildew in the summer when humidity levels are high. You may be lucky enough to have it growing naturally in your garden. 3. 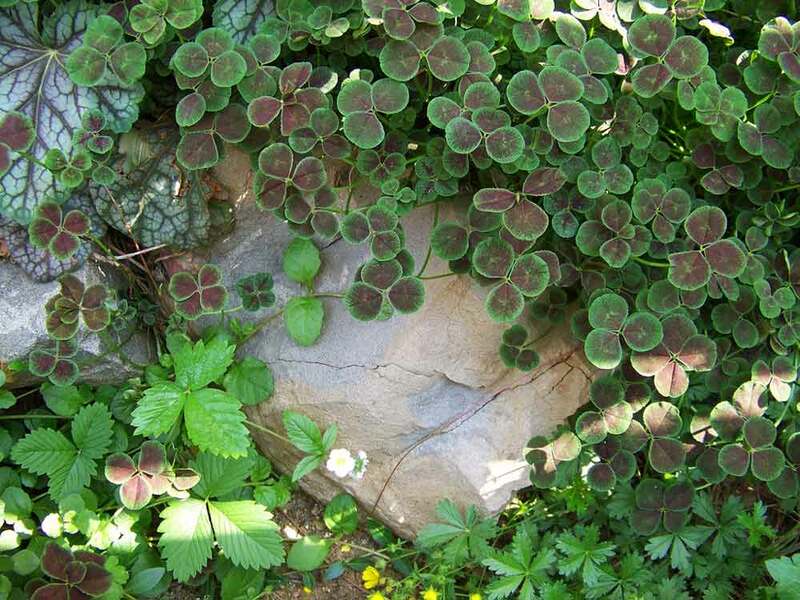 Dichondra brevifiola Buchanan: This groundcover is easy to grow from seed or root pieces. It fares better than mercury bay weed as a lawn cover. It tolerates poorly drained, but fertile soil, and it grows in full sun. ﻿4. Fragrant Thyme: In New Zealand, you have many choices of thyme to choose from as a ground cover for your lawn. White thyme, for instance, is a great creeper. It stays low to the ground, doesn’t require a lot of mowing and gives you fragrant white blossoms that leave off their oils when mowed or stepped on. ﻿5. Corsican Mint: An excellent ground cover, Corsican mint has tiny leaves. It grows well as a lawn substitute. It likes well-drained soils and sunshine. And when you mow it or walk over it, you’re treated to a minty scent. 6. Native Pratia Angulata: This ground cover will grow to 10cm x 2m. It’s also called lobelia angulate. It’s a pretty ground cover that produces white flowers in spring and red berries in the fall. 7. Blechnun Penna-Marina: This fern is a native of New Zealand. Another low-growing, easy-to-take care of plant provides dense leaves and spreads throughout your lawn via the plant’s rhizomes. 8. Gravel Garden: A gravel garden is another alternative to a typical Kiwi garden. Instead of lawn grass, your lawn has a thick layer of gravel added to it. Gravel does a great job of keeping weeds out of your garden. Better yet, you won’t need to mow it. Drought-friendly plants are planted in the gravel. They need some extra tender loving care for the first two years. In the third year, you can leave them alone, and they’ll survive. 9. Artificial Turf: Astroturf, fake grass, call it what you will. It’s the ultimate in a no-mow lawn. You replace your turfgrass with fake grass. When the sun beats down on artificial turf, it does get pretty hot to the feet. But the only maintenance needed includes hosing off pet waste and using a leaf blower to remove debris. No weed control and no fertilizing needed. 10. Perennials: Spruce up your flowerbeds with perennials. You get more return on investment than annuals because perennials come back every year. Plus, you cut down on garden maintenance by planting native perennial flowers. Native perennials are even better because they can survive drought conditions, and other weather stresses better than non-natives. Artificial grass can grow on you. 11. Stone Mulch: Skip natural mulch for stone mulch. Gravel mulch keeps weeds from popping up, provides a low-maintenance alternative and gives colour to your backyard landscape. Plus, stone doesn’t break down or need to be replaced twice a year. Indeed, you’re not required to have a typical grass lawn in your garden. Instead, exchange your lawn grass into one of the 11 options above to give you more time to dedicate to your weekend. If you still want to keep your lawn grass, you can skip the mow. Instead, call your local Crewcut to provide you with a lawn care service. Call us today at 0800 800 286 or fill out our contact form. At Crewcut, we service the following New Zealand regions: Auckland, Bay of Islands, Christchurch, Dargaville, Franklin, Hawkes Bay, Hokianga, Hutt Valley, Kapiti, Manawatu, Nelson, New Plymouth, Otago, Rodney, Rotorua, Taupo, Tauranga, Timaru, Waikato, Wanganui and Wellington. As temperatures plummet and the nights draw in quicker than they did over December and January, it can only mean one thing. Autumn is here. It will just be a matter of time before daylight saving kicks in and trees say goodbye to their vibrant green leaves for stunning shades of gold, red, and yellow. However, for the avid gardener, Autumn has so much more meaning. It’s the time for harvesting crops and preparing for a new season’s growth on the back of it. If you need a helping hand knowing what plants to plant this Autumn, or you’re not sure what the next step is, then read on. The experienced and knowledgeable Crewcut team is here to help. Take a look out into your garden and check out the fruits of your labour. Are they ready for picking? If you have been growing pumpkin or squash, rhubarb, rocket, silverbeet, beans, courgettes, cucumbers, or lettuce, then it’s time to harvest. All of these delicious produce should now be ready to consume. Harvesting time also provides an opportunity for pickling, making sauces, jams, and marinades to share with family and friends. Now that you’ve harvested all your produce and had a garden tidy up, it’s time to consider what you are going to plant for the next growing season. Will you stick with vegetables, plants, or flowers? Or, will you opt for a mixture of all three? Below, we’ve included some of the most popular things to plant once the cold weather hits. Broccoli is one of the easiest vegetables to grow, while also being one of the most nutritious. Start the growing process in seed trays before planting them in your vegetable patch within 1-1.5 months. You can sow bean seeds directly into the ground now, but ensure you use stakes to help them grow upward as they start to sprout. If you want to add a splash of color to your garden over Autumn, then consider planting pansies. You can start the growth process in Autumn and enjoy them through winter, spring, and summer. You can plant them in hanging baskets, window pots or boxes, or even garden borders. They grow beautifully in well-draining soil with potting mix. This heat-tolerant plant is stunning and easy-care. Lettuce forms the foundation for any sandwich or salad, which is why it’s a must-have in any autumn garden you’re getting ready. You can sow lettuce seeds directly into the ground, but ensure you cover them with a drink bottle cut in half to protect them from hungry birds. Sweet peas are a beautifully fragrant flower that you sow in autumn for flowering in spring. Make a tentfrom bamboo stakes and plant the seed directly into the ground. Once they grow, they cling onto the tent. While they’re not everyone’s favourite childhood vegetable, brussel sprouts can be quite a worthy ingredient. They are also exceptionally easy to grow and work beautifully with other seasonal vegetables lightly sautéed in a pan. Start the growth process in a seed tray before planting out in four or six weeks. You may also like to add lime or nitrogen when they are halfway through their growing process. If you’re a novice gardener, then carrots are going to be one of the most lucrative plants to grow. It can take a disaster of mammoth proportions to see your carrots fail to thrive. Plant them in well-draining soil and water them daily until they start to grow. Before long, you’ll have fresh baby carrots for a range of delicious menu items. Autumn can be quite a busy time for the average gardener. If you’re not perusing the rows of seed options at your local vegetable store, you’re trying to get your garden beds ready for a new crop of plants. If you’re feeling a little frazzled, and don’t know what to do next, then stick to this list. It can see you on your way to a prosperous autumnal planting season. Dry your seeds in preparation for spring sowing. If you save and store your bean, melon, and tomato seeds, you don’t have to buy more when it comes time to plant them. Add a new layer of compost to your garden to replenish the soil. Thin your carrots to reduce the risk of uneven root development. Don’t be afraid to grow lettuces in cold weather. Protect them, and they will be fine. Cut long and leafy stems from your tomato plants to promote fruit growth on the lower stems. Feed your established plants with nutrient-rich plant tonic to promote healthy growth. Use a mildew spray from your local garden store to prevent mildew from affecting your courgettes, cucumbers, and marrows. It has been hard to say goodbye to the blue skies, festive fun, and games of backyard cricket that summer brought us. Autumn is here, and it’s now time to embrace the season by planting beautiful vegetables and flowers to carry us through a new season of growth. Because trees take such a long time to grow, deciding whether to cut one down or trim it can be a tough call. There could be advantages and disadvantages for both situations, but what if you don’t make the right decision? You may have cut down a tree for no reason. Before you go ahead with tree cutting or tree pruning, think of the following points. They may help you to make a decision quickly! There are many reasons why you would decide to prune your tree, and knowing how tree pruning can solve problems may stop you from hiring tree cutting services. There are three main reasons for pruning: tree health, aesthetics, and safety. You may like to trim branches if they look terrible or you want to benefit from better fruit yields. You may also like to prune your trees if the branches are damaged, cracked, or don’t look safe. In this case, you have to ascertain whether the damage is severe enough to consider tree cutting as opposed to only tree pruning. Finally, tree pruning is beneficial for the health of your tree. It encourages growth, removes dead and dying branches, and can end up being the more suitable option – instead of having to call someone to come cut it down! When Should You Undertake Tree Pruning? If you have decided that tree pruning is far better than having to cut your tree down, then you will want to know when the best time of year is. However, that can depend on the type of tree you have. Winter tends to be an excellent time to trim trees as they are dormant and don’t have new growth. In summer, pruning can slow down unwanted growth, while helping you to identify problem branches as well. Autumn tends to be less suitable as trees heal slowly and can succumb to air-borne fungi. If you decide to prune in spring, wait until the flowers begin to lose color or structure. Why Insist on Tree Cutting? Knowing how much good you can achieve by pruning your trees, why should you still go ahead with tree cutting? There are many reasons why tree cutting is a better option than getting out the secateurs and giving your tree a haircut. Trees can succumb to all types of illnesses – some that you can’t fix through tree pruning and removing diseased branches. A sick tree is a dangerous tree, as it’s not as strong as a healthy one and can spread its disease to other trees as well. The best thing you can do is chop it down. Ask for expert help on how to achieve this safely. Trees don’t always grow how you want them to. Some end up on precarious angles which can be dangerous in the wind, while others end up too close to your personal property, power lines, or neighbouring properties. If tree pruning cannot rectify the problem and remove the hazard, removing the tree is the best option. Left untended, tree branches can cause damage to people, property or power lines. If you plant several trees and they grow up together, you may find that they are fighting for their share of nutrients, sun, and water. Unfortunately, there is going to be a loser in this situation. You can remove a healthy tree to let the smallest one access what it needs, or you can remove the one that’s not thriving. While trees can add so much beauty to your backyard, they can also create just a little bit too much shade. Shade can cause mould and dampness, and can even create the right conditions moss to grow and spread as well. If you have other trees in your yard that are less of a problem, you may wish to chop the troublesome one down and focus on the others. Trees have many benefits. They offset our carbon footprint, improve our mental wellbeing, and brighten up any public park as well. However, they also provide us with wood for building and burning. If you want to stock up on winter firewood or you need supplies for woodwork, then you would go down the tree cutting route instead of tree pruning – as it’s serving a purpose. Whether you decide to cut down your tree or only prune it, make sure you are up to the task. Even tree pruning can be labour-intensive, so you may find that calling in the tree experts may be the best option. The same rule applies to tree cutting. If you don’t own the correct safety gear or a chainsaw, you may find that hiring someone with the right tools and experience can make for a successful tree cutting exercise. Knowing whether to trim or cut your tree down can be a personal choice. Believe it or not, in some cases it can also be an emotional one. Weigh up the pros and cons and find out whether pruning can solve your problems or whether tree cutting is the best and final solution. In New Zealand’s warmer climes, fruit trees are a Kiwi backyard staple. From lemons and grapefruit, through to apple and feijoa, there is certainly no shortage of options to fill the fruit bowl. However, not every homeowner knows how to make sure their tree produces the best fruit – which is paramount if you’re an average Kiwi kid trying to sell homemade lemonade outside your house. If you only planted fruit trees to see what would happen, or you inherited them from a previous homeowner, then you may not have inherited the knowledge that goes with them. No matter how you came to be in possession of a fruit tree, however, it’s a good idea to find out how to treat it right. Below, you will find all the information you require on pruning fruit trees and general fruit tree care. Even if you’re not much of a gardener, it’s important to know the basics of tree trimming or have contact information for someone who does. Otherwise, you may not bear the best fruit – or have the best-looking fruit trees either. Pruning trees is essential for many reasons. Firstly, it makes the time for harvesting that much easier. If you let your fruit trees grow large and unwieldy, then how can you possibly hope to collect the fruit from them? Reducing the size of your tree every year, while keeping it in healthy growth, helps to make harvesting the literal fruits of your labour that much less labour-intensive. However, tree trimming can also have some surprising side effects for the health of your fruit trees. When you undertake tree pruning, you are encouraging new stems to grow, which help to create a bountiful harvest. You are also enabling better airflow and light to promote ripening. As a rule of thumb, there should be a gap through the center of the tree large enough for a small bird to fly through. Finally, tree pruning is beneficial for achieving the desired shape in your yard, as well as removing any branches that are dead, dying, damaged, or diseased. When Do Fruit Trees Not Require Tree Trimming? Believe it or not, there are now new fruit tree varieties available that require no pruning. These include dwarf cultivars such as nectarine, peach, apple, and apricot trees. Ask a gardening expert whether your fruit trees need tree pruning or if they are of the prune-free variety. If you are new to fruit tree ownership, or you are beginning to take an interest in the ones you have, then you may wonder when a good time is to undertake tree pruning. The best time for pruning trees can depend on the type of fruit they bear. Apple and pear trees require annual tree trimming every winter to help prepare for an even better crop than the year before. Kiwifruit trees, however, need pruning in winter back to five buds. You then have to tie long branches back so you can train them to follow a particular shape. You will also need to do the same for cherry trees. With feijoa and citrus trees, you can start tree trimming right after harvesting. Wait until frosts pass and you may also get away with biennial pruning. If you are lucky enough to have a thriving nectarine, peach, or plum tree, then ensure you undertake tree pruning in summer. If you choose to prune in winter, you may end up spreading disease which ruins crops. While you can begin tree pruning yourself, there are also plenty of expert gardeners who can help with tree trimming and all manner of tasks. If you lack the time, tools, or confidence to trim your fruit trees yourself, then make a call to avoid your fruit trees getting neglected. Alternatively, in a few steps, you can be on your way to confident tree pruning on your own. The best day for tree trimming is a dry day with no wind. Wait until the grounds are dry and there is no hint of rain in the air. By doing so, you can limit the spread of any diseases or fungal spores which could ruin your crops. The best way to prune your fruit trees is by using a pair of sharp secateurs. These can help you achieve a clean, angled cut above the buds. Don’t prune to excess. While garden tidy-ups are something you can hire someone else to take care of, you can also do it yourself. Remove all the clippings and dispose of all the mess you made. You may also like to clean your secateurs after use and before storage. Fruit trees are prone to winter diseases, so after you finish with tree trimming, you may like to set them up to survive. If you have any deciduous fruit trees, spray them with a copper-based concoction to prevent winter disease. Whether you’ve had fruit trees for a long time or you’re new to gardening altogether, you will enjoy your new-found hobby. However, not everyone has the time for tree trimming and taking care of fruit trees. Need extra help with your fruit tree? Get in contact with a Crewcut specialist! You may wonder what climate change and global warming have to do with tree care and planting trees, but you will be surprised at the connection. However, firstly, it’s important to understand what climate change is and what it means to you. Climate change relates to climate patterns, natural processes that are a part of our earth’s history. They became more apparent around the late 20th century, and are thought to be caused by the sun’s energy, earth surface changes, the greenhouse effect, and atmospheric carbon dioxide linked to the use of fossil fuels. The greenhouse effect is a process that warms up the surface of the earth. It’s both natural, through the likes of volcanic eruptions, and caused by humanity. Earth is only warm enough for us to inhabit it because of the greenhouse gases, equating to a temperature of around 15 degrees. However, because humans are creating more greenhouses gases, they are warming up the earth. So far, humanity has increased the earth’s temperature by around 35 percent. What Can Tree Care and Planting Trees do for Climate Change? It can still be confusing to understand how planting trees and partaking in tree care can make a difference to climate change, but trees play a pivotal role. One of the major gases responsible for much of global warming is carbon dioxide, produced by humans burning coal and oil and other fossil fuels. It’s also natural, but not at the same high levels. By planting trees, you can offset the greenhouse gasses you are putting into the environment. Trees absorb carbon dioxide, storing it within themselves. The more trees we plant and grow, the more we can benefit from fewer emissions and more forested land. You might think that you, one lone Kiwi, can’t do a lot to help climate change or our country. However, there is plenty you can do. You can gift native trees to loved ones for birthdays and other special events, start tree registries for special events and become involved in your community meetings with a focus on planting more trees. You can also fund trees if you have the opportunity and ability to donate to a good cause, and ask councils to plant trees for the benefit of waterways, erosion reduction, and biodiversity. You might think that one person can’t do much, but planting trees and tree care is something that everyone can do. However, beyond tree care and tree planting, there are also other things you can do. You can reduce energy consumption in your home or business, opt for alternative sources of power such as solar, and travel smarter by walking or biking instead of driving your car. New Zealand wants to reduce its greenhouse gas emissions by 30 percent below its 2005 level, but we need your help to do it. Where Does New Zealand Stand with Climate Change? Being isolated from the rest of the world in little ol’ New Zealand can make many people feel like significant world events don’t impact them. When it comes to climate change and global warming, however, they do. We are blessed here in New Zealand to be able to produce 80 percent of our energy through renewable sources, but we also have a much higher portion of production in the food industry which emits a significant amount of greenhouse gases. It takes ten times more energy to produce one kilogram of meat than it does to produce one kilogram of grains. If you want to do your part for New Zealand, climate change, and the world, then you can start by planting a native tree. However, as not everyone is born with green fingers, it’s a process that might take some figuring out. You can ask for expert assistance, or you can talk to your local garden store worker when you buy a beautiful native tree. The best time of year for tree planting is between April and May or August to September. If you plant in a drier time of year, you will spend much of your time watering them to keep them alive. Prepare the site by watering it and keeping the plant cool. Dig a wide hole with room for the tree’s roots to grow. Remove the tree from its bag and place it in the hole. Cover the roots with a thin layer of soil, compacting it down on each layer. Plant it up to the same area as it came in the garden bag. Make the top layer loose soil and water it. Now the fun begins! Create a mulch out of old newspapers, cardboard, and carpet, covering it with wet bark chips and straw or compost. Doing so helps to keep moisture in the ground while protecting the tree’s roots and stopping the growth of weeds. If you manage to retain moisture well, you will only need to water once per week in hot conditions, or less with correct mulch layers. Shade and cover the ground until the trees are well established – at around two or three years old. Climate change is all of our problem, and the more we can do to fix it, the better off the planet will be. Take the time to find out more about climate change today, or get involved in planting trees and tree care. You will be glad you did. With daffodils beginning to pop up everywhere, it’s clear to see that can only mean one thing: spring is on its way. There is nothing that brings more joy and hope than the sight of yellow and white flowers scattered throughout gardens and fields and the knowledge that the cold and dismal weather of winter is now behind us. What’s more, daffodils also signify new lambs being born, and the Cancer Society’s biggest fundraiser: Daffodil Day. This year, Daffodil Day falls on August 31, which means volunteers will be out in their droves, offering daffodils in exchange for donations. Click here if you want to be a part of Daffodil Day, or support the noble cause. What Does the Daffodil Mean? Daffodils, while beautiful, also have many meanings. They are typically the first flower to bloom as winter turns to spring, and they are also the symbol of rebirth, new beginnings, awareness, memory, forgiveness, and vitality. For the Cancer Society, however, the daffodil is used for Daffodil Day to signify and symbolise hope for a cure. Cancer claims the lives of thousands of people in New Zealand every year, but with research – for which funding is necessary – there is hope for a cure, prevention, and education. If nothing would bring you more pleasure than opening your curtains in the morning to see striking white and yellow fresh blooms in your garden, then it might be time to learn how to grow daffodils. Daffodil care is easier than you think, but if you need help, there is always an expert on hand to lend their advice. Contrary to popular belief, daffodil types differ depending on your area. That’s why when you see people out collecting money for Daffodil Day, you find that some are yellow with orange centres, or white with yellow centres. Talk to a garden store attendant about the best variety to suit your region. If you’re not an avid gardener, never fear. The pre-planting stage of daffodils is easy. However, if you don’t feel confident completing this task yourself, contact daffodil care experts who can help. Pre-planting your daffodils involves waiting until Autumn, around daylight saving. When the soil is cold enough, you can plant your bulbs so that they will lie dormant over the colder months. Make sure the bulbs are decent in size for a better chance of a successful bloom. Learning how to grow daffodils properly can often take more than one planting season to get the hang of it. When you’re looking for a site in which to plant your bulbs, pay attention to the positioning. Make sure it’s an area that gets plenty of sunlight but also has free-draining soil. Some varieties like a bit of shade, so pay attention to what the packaging of your bulbs state. 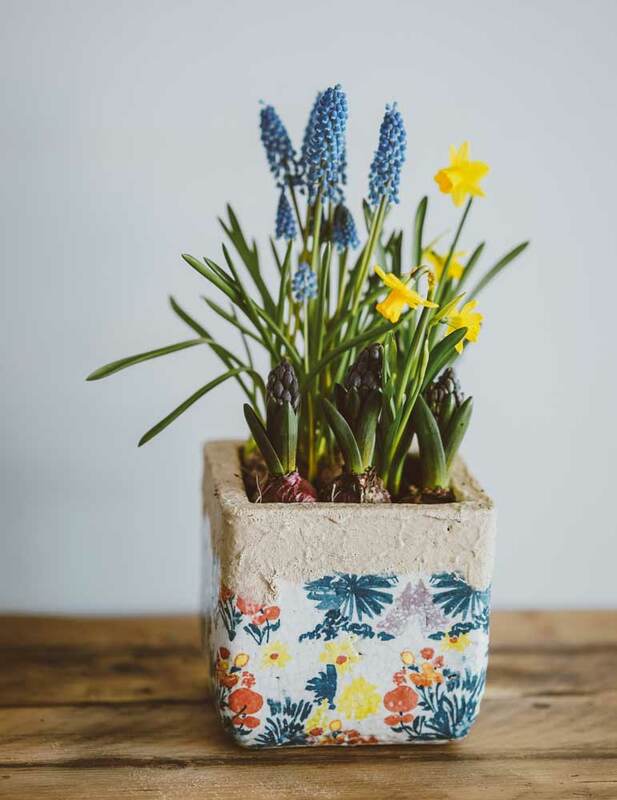 If you don’t have a lot of space to spare in your garden, or you prefer to plant your flowers in pots, then it’s also possible to learn how to grow daffodils in containers as well. However, you will need to opt for bulbs that grow shorter with smaller flowers. Find a large pot or container with excellent drainage holes and fill it with soil or potting mix with fertiliser. The slow-releasing variety is the best. Plant the bulbs evenly in the pot but ensure that none of them touch each other or even the edges of the container. Give them plenty of water and shade until you see shoots beginning to form. Once they start to grow, you can move the pot into the sunlight. Then, when you begin to see foliage, you can apply liquid fertiliser to help with flowering. Before long, you will have a pot filled with beautiful daffodils – just in time for spring and Daffodil Day. Rather than buy new bulbs every year, did you know you can reuse the ones you already bought? Below is a step-by-step guide for daffodil bulb care. Once your bulbs have finished flowering, fertilise them with bulb food. Tie the bulb’s foliage around itself and secure it in a rubber band. When the leaves encompassing it have died off, remove the bulbs from the soil. Seeing volunteers selling vibrant posies of daffodils for Daffodil Day can bring a smile to anyone’s face. However, if you find yourself passionate about this stunning flower for more than one day a year, then why not make it a real hobby? In New Zealand, the New Zealand Daffodil Society provides a host of information for daffodil care, how to grow daffodils, and how to join a Daffodil Club. 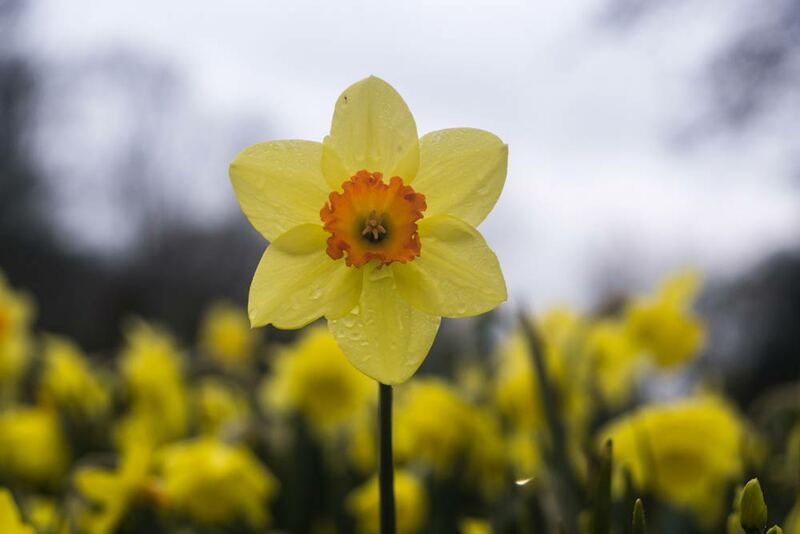 If you become part of a club along with others passionate about the flower, you can attend daffodil shows, see various displays, learn where to buy the best bulbs, and even how to grow specialist daffodils from high-quality bulbs. You can also learn more about upcoming events. What started out as an indicator that better weather was on the horizon has now turned into a symbol for hope and a chance to make money for cancer research and resources with The Cancer Society. If you want to grow daffodils for yourself and you’re not sure how, you will find this information above can go a long way toward helping you realise a new passion. You never know, it could be the very thing you need to uncover a hidden garden talent. The world is becoming more and more like a concrete jungle by the minute. Luscious lawns are turned into residential high-rise buildings, while even forests are being cut down to provide the resources to make it happen. Therefore, it can be hard for your children to learn how to be environmentally friendly, especially in a world that hasn’t quite welcomed the concept with open arms yet. If you want your children to appreciate nature and all its beauty, while encouraging them to do their part to hold onto it, then teach them these gardening hacks. You may find their interest in the environment blossoms before your very eyes. If you want your children to be environmentally friendly, then you need to practice what you preach. Rather than douse your garden in the most toxic chemicals on the market to rid them of insects, always hunt for organic alternatives. You can buy pre-made natural products designed to stop bugs in their tracks, or you can sit down with your children and create your own bug deterrents. Tip: Insects hate coffee grounds, so consider stocking up on these! Teaching your children to be environmentally friendly doesn’t have to be a classroom lesson. They are sure to get plenty of these at school. Instead, you can make it a fun experience. Building a birdhouse is not only a way in which to spend time with your children outside, but it educates them on the importance of birds. We need birds for controlling pests and pollinating flowers, but also for weed control and help with the gardening too. Birds love to eat the seeds of weeds on your lawn, so it’s a win-win for both bird and property owner. What’s more, if you build birdhouses for your property amongst your lawn and garden area, you benefit from conserving the bird population which can be rare in a residential area. Children love to build things. It’s an inquisitive part of their nature that sees them like to find out how something begins, works, and ends. Therefore, if you find yourself in need of a cost-effective water collection system for when you’re gardening, the kids can learn an awful lot by helping you build one. Not only does having such a setup save you from having to use the town’s water supply for your garden, but it means you can use a sprinkler and hose to your heart’s content. When the time comes to get the children together and learn how to be more environmentally friendly, you may find a few of these collection systems are within your skill set to produce. Whether you contact an expert to help with the process, or you and the kids want to give it a go on your own, you will find that planting flowers has many benefits. Of course, the main advantage is that you’re doing your part by being environmentally friendly. However, did you know there were so many other reasons why planting flowers is a good idea? When you get the gardening gloves and head out to your lawn, you will marvel at the beauty of the flowers. They’re bright, vivacious, and add so much colour and fun to your yard. What’s more, their environmental benefits are unparalleled. Flowers help to remove pollutants from the air during photosynthesis. The leaves of the plant absorb carbon dioxide, releasing oxygen in return. And, if you and kids head outdoors and plant your favourite flowers, you also benefit from knowing they can help to reduce flooding and soil erosion as well. For the birds, the kids, the bees, and yourself, there are so many reasons to head to your local gardening store and get planting. If you haven’t already got a vegetable garden, you may find starting one with your children is rewarding in so many ways. Firstly, it gets the kids off their mobile devices and out into the garden – something you may find difficult on a regular basis. However, showing your children how to start a vegetable garden can also set them up for life. When they grow up and move out of the family home, they will be able to provide fresh vegetables for their family in the way you did for them. What’s more, you’re doing your part for the environment by opting out of plastic-packaged vegetables from the supermarket. Gardening can be a rewarding job, but it does take patience. Therefore, it’s a good idea to try and make the entire process as fun as possible. Let the kids choose what they want to grow and buy them children’s gardening equipment so they can feel and look the part. After weeks or months of care – something you may need to actively encourage to stop them forgetting - you can then let them enjoy the fruits of their labour. For mum and dad, it’s another win, as the kids may be more likely to eat their greens when they know they’ve grown them themselves. Being environmentally friendly doesn’t have to be a hard task, but it does require you to think outside the square a little. If you’re ready to get outdoors and teach your children to be responsible for nature, consider trying out any of these tips and tricks above. You may find your children have hidden green thumbs that just need a little bit of nurturing. Want a little bit more help in the garden? The lawn and garden connected to your home is an extension of your living space. You want to be able to go outside and relax, watch the clouds go by, and enjoy a cup of coffee as the sun comes up. Lack of space doesn’t mean your lawn and garden doesn’t need to reach its maximum possibility. A patio can turn into an outdoor pantry, complete with fresh herbs, vegetables, and fruit. Your lawn can be a relaxing place to read books and lay in the grass. Whether you're living in the inner city of Auckland, Wellington, or Christchurch, there's plenty you can do for an effortless lawn and garden. In an average outside space, you want to fill a quarter with plants and leave the remaining three quarters to open space and seating. Those living in the inner city want to be cautious not to add too many plants. It is easy to make an inner city garden feel cramped and confined. An interesting focal point can be several pots stacked together with flowers. Place the largest terracotta pot at the bottom and fill with potting soil. Then, place a smaller pot inside. Fill the smaller pot with soil, and continue this process with however many pots you have. The pots progressively get smaller. Then, plant flowers in the soil not covered by pots! It creates a lovely visual. You can find DIY instructions from Den Garden. Inner cities typically don’t offer massive lawns, but everyone can go vertical. A beautiful pergola allows you to grow strawberries on top. You can hang baskets on the sides with flowers, or grow tomatoes upside down! Use a trellis or two to grow pole green beans and cucumbers. A trellis takes up minimal space. To add dimension and increase privacy, try tall pots filled with native grasses. Adding height also brings an interesting element to your garden. Since your outdoor space is miniature, size down on the items you use. Planting a full-size apple tree is not a wise idea, but a small backyard can handle a dwarf fruit tree that reaches heights of seven to nine feet. Instead of using large paving stones for a walkway, use a larger amount of small tiles. It makes space feel larger rather than crammed. Be selective about the furniture. Bulky items aren’t your friend. If you have a narrow garden, it might feel as if you are stuck in this little space. One great idea tricks the eye, and that is lining your deck or yard from side to side with plants. So, put multiple pots or plants along the border on each side of your property. For those with wide but short garden, try adding items from top to bottom. Tricking the eye and making illusions is key to the perfect inner city garden. As you plan how to decorate your inner city garden, don’t forget the surfaces. A fence, the sides of your house or a shed, or windows are perfect places to add décor. Place window boxes or flower pouches under windows. Hang a pallet on a fence or the side of your house for the perfect urban herbal garden. Garden pouches are increasing in popularity and allow anyone with a fence to grow plants like lettuce and herbs. Another surface could be a table placed outside. Put a shallow tray on the table and grow herbs on your table. That makes harvesting very easy! In a small space, guests will quickly notice when you aren’t taking care of your lawn properly. Mow your lawn when it reaches two to three inches high throughout warmer seasons. Try not to mow any shorter because the roots need to spread deeply to allow the grass to thrive even if rainfall amounts are low. Treat weeds in the spring; they are noticeable in smaller spaces. In the fall, remember to fertilize your lawn to prepare it for any cold weather coming your way. A well-maintained lawn makes your garden space more appealing for guests and yourself. In the spring, make sure you lay grass seed over bare spots in your lawn. You want whatever lawn you have to look fantastic, along with all of those plants you have. Planting grass seed requires little effort on your part. Make sure you plant the correct type of grass, which depends on your location and amount of sun your lawn receives. Shady lawns require different grass that grows well without an abundance of sunlight. Pallets are popular right now. People use them to build fences, tables, compost bins and more. Pallets are perfect shelving for your inner-city garden. It doesn’t take much work to make them the perfect home for trailing flowers, herbs, and grasses. Succulent plants even enjoy life on a pallet shelf. Even in the smallest of gardens, there is a spot where you can add a hideaway. That might be a bench surrounded with tall, native grasses. It could be a hammock swing hung under a tree. An arbor covered in vines could hide a comfortable bench seat. These secret areas are popular and allow you to enjoy your garden space. You can sneak away to these areas when you need a bit of silence. It also adds interest to your garden when guests find them! The great thing about perennial plants is that you plant them once and they continue to grow back each year. That means you have to spend less time each year preparing your lawn and garden. There is an abundance of gorgeous perennials so that you will find something to suit your tastes. While those who live in an inner city tend to have small outdoor spaces, that doesn’t mean you can’t take full advantage of the space given. Use colours, wise placement, and utilise every spot you can. With the right design and vision, your outdoor garden will become your favourite place to go. Gone are the glory days of summer to the now dreary days of winter. You don’t need to be on active garden duty, but there are some winter chores you need to do to prepare your garden for spring. It’ll soon be time to plant fruit trees and roses. You can prepare holes and add manure, such as sheep pellets, cow or horse manure for these woody plants to develop a deep root system and plentiful fruit and blooms. Next, you want to remove an inch of mulch from your gardens to allow sunlight to penetrate through and warm up the soil for spring planting. If you have poorly drained soils, you want to add gypsum to your garden. Gypsum binds up soil particles together allowing air to help evaporate excess water. Gypsum also helps open up the soil to drain away water. Potassium, also known as potash, is a macronutrient that every plant needs in winter to protect plants from fungal diseases and rot. Your lawn also needs potash in late winter for a quick green-up in spring. Potash enables fruit and vegetables to develop larger crops, it produces abundant flowers and increases plants’ overall health. Potash works in the lawn, too, helping yard grass develop resistance to diseases as well as it improves your lawn grass’s ability to survive drought and heat stress. Before applying potash to your gardens, test your soil’s pH as well as the macronutrients’ levels. Your acid-loving plants, such as azalea, hydrangea, and rhododendrons don’t like alkaline soils. So, don’t add potash to beds with these shrubs because it’ll make the soil more alkaline. Also, if you have sufficient amounts of potash in your lawn and gardens, you don’t need to add more. Potash turns to salt when it’s in abundance and will damage plants. Finally, if you have sandy soil, you can add potassium to it. However, you’ll also need to add leaf litter and other soil amendments to help with drainage and soil health. Wood ash added to your compost also improves potash levels. You should fertilise your lawn in late fall to prepare it for winter or in late winter to get grass to green up quickly come spring. Liquid fertiliser brings the fastest results. Your fertiliser should be high in nitrogen and potassium to give your lawn grass a good start. Add liquid fertiliser to your watering can and mix with water. Sprinkle it over your grass. You can also use granulated nutrients, but you’ll still need to water your lawn afterward to activate it. Since lawn grass grows best in sweet soil with low acidity, make sure you add lime a few weeks after you’re finished feeding your lawn with fertiliser. In winter, you don’t have as many gardening and lawn chores to complete. However, there are still some necessary things to finish before spring’s arrival in September. If you need a bit of extra help with fertilising, the team at Crewcut will be happy to help this winter. As winter approaches, there are some shrub and tree pruning jobs that are best done during the coldest months of the year. Generally speaking, your deciduous (their leaves drop off in fall) bushes and trees need trimming in the winter. Since deciduous trees lose their leaves in winter, you can see clearly what branches need to go and which ones can stay. However, not all trees and bushes need pruning. To successfully take care of your woody plants in winter requires that you know which ones to trim and which ones to leave alone. Basically, you can prune trees and shrubs that are deciduous as well as some fruit trees. However, maples and magnolias don’t want to feel your secateurs on their limbs. The only tree pruning you need to do to maples and magnolias is to remove any dead, diseased or insect-infested limbs. If not, heavy winds will lob off those dead branches for you, endangering you and your family. Also, you want to get rid of any diseased or insect-ridden branches on maples and magnolias, so the disease or infestation doesn’t go farther than the injured limb. Selective pruning is a form of pruning trees and bushes that respects the tree’s natural shape, but it also allows for air to circulate and sunlight to penetrate these woody plants. However, some homeowners and tree care companies believe in topping trees. Tree topping leaves your trees unbalanced and ugly. Plus, you’ll notice spouts rather than branches growing on the top of the tree.These spouts are fragile limbs that could break off during a severe storm. So, tree topping not hurts the tree, but it also weakens it. The most popular shrub in Kiwi gardens is the rose. So, it’s only appropriate to talk about the rose’s winter pruning needs. It’s safe to prune most roses over the winter because New Zealand roses bud on new bark rather than old bark. You want to cut above the buds and trim off old, dead or diseased canes. It’s recommended that you prune roses from mid-June through August unless you live in an area that gets very cold. Then you should wait to trim them in August. 1. Apple and pear trees: These two fruit trees need pruning every winter to ensure a superb crop the following summer. Matter of fact, pears only provide a yield every other year. So, when you correctly prune this tree, you’ll find that it produces an abundant crop of pears in the second season. 2. Grapes and kiwi fruit: Even though grapes and kiwis grow on vines, it’s important to mention them in a shrub and tree trimming article. These fruits need to be pruned back every winter, so they continue to produce plentiful crops. Your goal is to cut back these vines, leaving only three to five buds per plant. Finally, it’s vital to remind you of which fruit trees and woody vines that don’t need winter pruning. If you would trim them this winter, you’d be opening up these plants to disease and freezing temperatures. Your trees and shrubs deserve the best care, and that includes trimming jobs. If you want to avoid the hassle of tree pruning this winter, make sure you hire a professional operator from Crewcut. Check with your local Crewcut operator to see if they are equipped are trained to properly prune trees and shrubs—preserving the woody plants’ natural shape and taking only off enough to keep them healthy. Fall is in the air. Moreover, that means it’s time to clean up your summer garden and prepare it for winter. While the days are getting shorter and the air is a bit crisper, you can still work the soil, creating beautiful landscapes as well as nurturing winter vegetables and herbs. It gives your gardens a tidy appearance. Are you planning on adding hedges to your property this winter? Check out this blog 'How to plant a hedge for privacy'. This fall, the first place you want to be is your vegetable garden. It’s time to harvest the remaining summer bounty, cook or preserve it for eating over the wintertime. For example, if you’re having a plentiful tomato harvest, you can add breading and fry up green tomatoes. You can also oven-roast tomatoes or make them into spaghetti sauce or stewed tomatoes. Your homemade spaghetti sauce and stewed tomatoes freeze well for you to use throughout the winter. Flowers give pops of colour and create a palette that brightens your landscapes and lifts you out of the winter doldrums. When you plant flower seeds in the warm soil in early autumn, you’re encouraging those seedlings to develop deep roots. During dry spells, your garden plants’ deep roots help keep the plants alive by finding new moisture stores in the soil. If you prefer not to deal with seeds, you can visit your local garden centre and buy established seedlings that you only need to transplant into containers or your flower beds. Pansies: These flowering plants have beautiful blossoms that come in a wide variety of colours, such as whites, yellows, pinks, purples and black. Here’s an easy gardening trick: When your pansies start to look leggy, trim them back and give them some liquid fertiliser. Your pansies will bounce back in a few weeks with more blooms. Polyanthus: Bold, bright colours will cheer up any winter garden. Polyanthus belongs to the primrose family. Lobelia: These flowers have the corner market on the blues. Lobelia produces sprays of blues, whites, pinks and light purples. Great for garden borders and hanging baskets. Alyssum: This is a hardy flowering plant. Alyssum looks exceptional in between sidewalk cracks, nestled in with spring flowering bulbs and as a border plant. It keeps reseeding itself throughout the winter. Alyssum comes in white, pink, cream, purples, apricot and a whole host of other colours. They also perfume the air with their gentle, baby powder scent. Fairy primrose: Another primrose variety that does well during New Zealand winter months. The fairy primrose grows larger than polyanthus. These primroses look great in a flower bed and containers. Forget-me-nots: Lovely white, blue or pink blossoms cheer up your flowerbeds. These little flowers look great as a border plant. Forget-me-nots will reseed themselves. You’ll want to pull out spent plants from your gardens before they start looking tatty. Violas: These blossoms are cousins to pansies. They’re more like perennials since they keep popping up throughout the winter and early spring. Violas look excellent in borders or containers. There’s something therapeutic about working in a winter garden—whether it’s vegetables or flowers. New Zealand’s climate makes gardening throughout the year enjoyable. Use these final fall months to get your vegetable and flower gardens in order. Then sit back to enjoy the blossoms and delicate scents that waft throughout your beds and borders. If you do require any help in the garden before winter makes its full appearance, the Crewcut team would be more than happy to help! Just contact us on 0800 800 286 or leave us a message in our chat below. The end of summer weather hasn’t been too kind to us in little old New Zealand. Experiencing two tropical cyclones in a short space of time, many parts of the country have suffered severe flooding. They say when it rains, it pours, and the past couple of weather patterns have done just that. If you’re fed up with your backyard filling up with water, and the lawn needing a lot more care, then we have a few creative landscape ideas to help you. You will need to observe how water enters your lawn, where the gravity pulls it, and where it ends up. Flooding only happens when the soil can’t absorb any more water, so it may take a few heavy rains for you to see. When the soil can’t drain away any more water it will run to the lowest point in the lawn which will be where the drainage needs to be. You may find that a bit of water actually trickles in from other parts of your property, like the driveway or downpipes. If this is the case you will need to find a way to divert this extra water. If you have no guttering or spouting systems, sure your lawn might be slanting the right way but it will be no match for the roof run off come a few days of rain! Consider installing a few gutters to collect the rain off the roof. Diverting downspouts away from your house and lawn in heavy rain will prevent water pooling near your house. The easiest way to do this is by using a downspout extender. These can be easily found at your local hardware store along with an elbow corner pipe. This can be easily attached at the base of the downspout and the water diverted away from the house into dry areas, or into any drains. Remember to check and clear blockages in your downspout extender prior to heavy rain to prevent overflowing. Just make sure you don’t divert your drain towards your neighbours or somewhere else it will become a problem. Get all the necessary materials (pipe/gravel/plastic) for the method you choose. Dig the trench to fit the pipe leading towards the space you want to divert excess water. Line the trench with plastic or gravel. Fit the pipe to the trench. Fit the entry point for water, whether it be stones or a drain like top. Cover the trench with stones/soil or grass. There are professionals that are experienced in french drainage, so have a look into those options if you are not so keen to start hacking away at your lawn. A DIY french drain can be done easily enough, just make sure you check with your council as to whether you are allowed to dig or not. There are so many ways you could construct your drain all using different materials. If you have a spot in your lawn constantly taking on a bit of water - this could be the simple solution for you. Select a spot on your property where water will run into it and plan out an appropriate shape for your rain garden. Plan out the shape of your rain garden and research some native plants, flowers and grasses that do well with large amounts of water. Plan to plant the ones needing a more drier climate on the outer edge. Dig up the turf of your grass at least 20cm deep. Create a berm on the edge as a border and remember to add an overflow, a break in the berm where excess water can flow through. Plant the grasses and natives and add a heavy mulch a few inches thick that won’t blow away. Feel free to add stones or other grasses on the outer edges. If water is running down your driveway, or down any hills in your property - this may be the answer for you. The basic function of a swale is to redirect water to other places, and soak into the soil along the way. So it is perfect to incorporate where there will be lots of water hitting as it can delay and soak up the water running to the bottom of any gradients. You might have seen these on large hills, or farms looking like a staircase. It prevents the water from rushing to the bottom and creating gullies - and from taking all the nutritious top soil with it. All you need to do is dig a long shallow trench along the contour of the land, and the water will flow where directed, spreading out the impact of the water. Swales can definitely be incorporated into your residential home by yourself, or if the job might be a bit bigger, consulting a landscaping professional is a good idea. Locate the water run off areas, where it rushes to as that will be where you need to prevent it from going to as quickly. Locate were you could dig the trench to direct the water, maybe a rain garden, drain or other part of lawn. Dig a trench 25cm deep or more along the contour of land, and adjust the width to your preference. Place the excess soil on the side of the berm, downward hill side. If building multiple swales, have an overflow spout running between them. Lastly, plant grass or plants on the berm to hold in place. Using heavier mulch on plants so that it that won’t float away come some rain. Planting more water loving grasses and plants in areas that take on water. Using rain barrels under spouting to collect water in heavy rain. These can then be used after wild weather. So there we have five ways you can prevent your lawn and garden flooding. Get creative and give it a go! Many of these methods can be done yourself, and now is the perfect time before winter sets in. Remember to do a few more preparations for wet weather and keep up with your lawn mowing even in winter. You could even consider working together if a few neighbouring properties are in the same boat with flooding issues. So, you decided that you want some privacy to drown out traffic noise, nosey neighbours or to create some green space. You don’t want to build a wall or a fence that doesn’t give you the privacy you want. Additionally, you want to add greenery that will add depth and dimension to your garden. A hedge that grows densely will keep out noise and prying eyes. And yet, it’s something that adds texture, colour and a home to local birds and insects. Growing a hedge is a great alternative to building a fence. Before you can plant, you need to purchase the right shrubs for the spot where you want to plant them. You also need to know how high your woody plant will be—and if it creates the privacy you desire. For example, how high do you want your hedge to grow—2m or 4m? To envision how high a plant will be, have someone stand on a ladder to give you a visual of that height. Some hedging plants, like photinia, grow up to 2m while michelia figo can grow up to 4m. Then, you need to decide if you want a hedging plant that flowers or one that is an evergreen. Fortunately, you have a lot of varieties and species to choose from to create the perfect privacy hedge. 1. Bamboo: Do you want to add a song to your garden? Then you need bamboo. It’s fast-growing and a popular privacy screen. When the trees sway in the wind, they sound like they’re singing. 2. 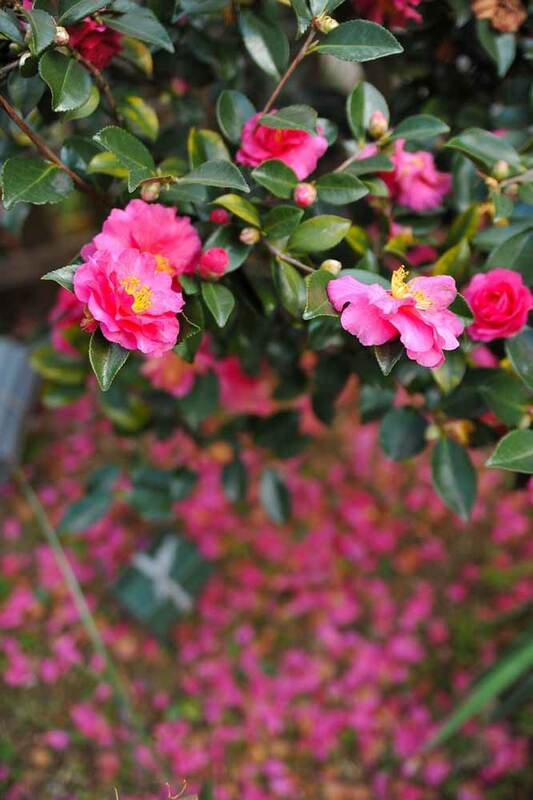 Camellia: Which variety gives you a living privacy screen—japonica and sasanqua? The sasanqua is the faster growing of the two types. The sasanqua has small leaves and a higher sun tolerance compared to its japonica cousin. Plus, it provides beautiful blossoms in autumn. 3. Griselinia: A New Zealand native, the kapuka (another name for griselinia) is an evergreen hedging plant that does well in drought and coastal conditions. It also attracts bird to its berries. 4. Michelia figo: The michelia figo is part of the magnolia family. It’s an evergreen that produces fragrant blossoms. It works well as a privacy screen due to its density. 5. Photinia: The vibrant red leaves look brilliant as a hedge in your garden. This hedging plant also produces blossoms. Now that you know what kind of hedge you’re going to buy, it’s time to plant it. You can plant each hedge in individual holes or a trench. It’s better to plant them in a trench, but you’ll need to keep them well-irrigated and fertilised. For your hedging plants to succeed, you need to first prepare your soil. For example, you want loose soil so roots can anchor and water can percolate deep in the ground. So, if you have heavy clay soils, you need to work it to make it loamier. Likewise, if you have sandy soil, you need to add compost or organic material to it for better water retention. How much space do you need between plants? It depends on your hedge variety and how dense you want it. Generally speaking, if you’re planting a 2m plant, you want to space the plants 1m apart. It’s tempting to comb out the roots of your new plants, but don’t do it. You can kill your new hedges. When you’re finished installing your hedges, feed them fertiliser, so they get a good start growing a deep root system. Plus, cover them and then add mulch to protect the roots as well as to keep the soil temperature even. After you finish planting your hedges, you must water them immediately. And they need a good soaking, up to 3-5 cm of water. You also need to continue watering your plants every day for the next two to three days, then cut back to two days a week, and finally to one day a week. Of course, this routine is based on your region, including the season, weather conditions and soil type. Your goal is to keep the soil moist. Get a hedge trim about twice a year. Your local garden centre can help you pick the right fertiliser to use. Each hedging plant has different fertilising needs. So make sure you follow the package directions. 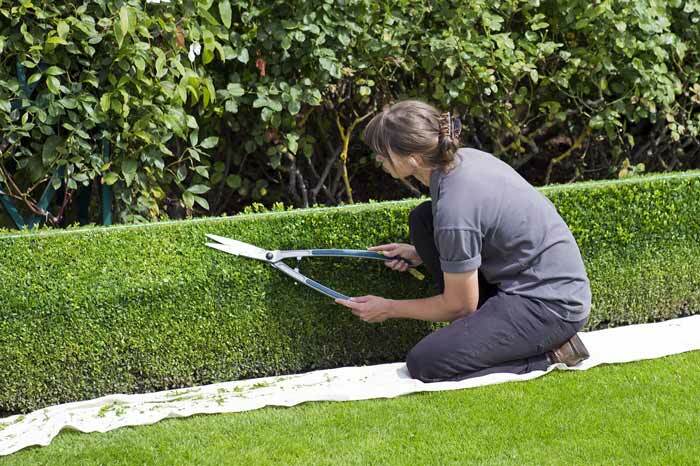 For pruning, it’s essential that you properly trim your hedges to respect the plant’s natural shape. But there is also more to it than a hedge trim every now and then. You also need to make sure that light and oxygen can get into the centre of each plant. To save you time and aggravation, you want to hire a professional hedge trimming company to keep your privacy screen growing densely and beautifully. 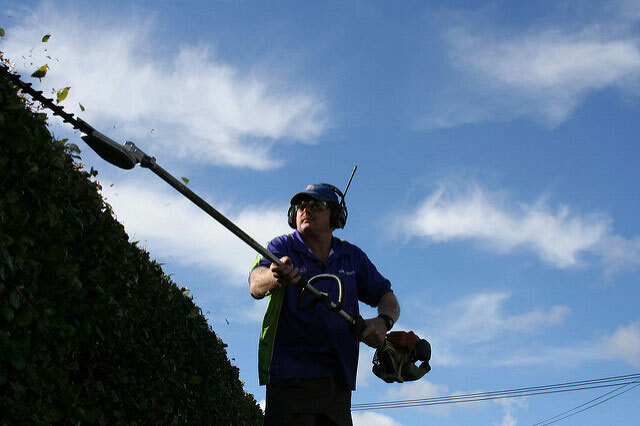 At Crewcut, our hedge trimming crews will bring new life to your natural privacy screens to protect you from wind, nosey neighbours and noise pollution. If you’ve been to your local park lately, you may have noticed something different – and I’m not talking about rubbish bins full of empties left behind by cricket fans. It’s the influx of greenkeepers and lawn mowing council staff trying to do something about the state of the grass after a crazy summer of droughts and cyclones. Unfortunately, the bad news is that your lawn at home isn’t in much better shape. When out lawn mowing and gardening, Crewcut contractors up and down the country have encountered lawns that are madly overgrown in some areas and sun burned yellow in others. So, what can you do to rectify the ravages of summer, protect your lawn from Autumn weather and get your lawn in tip top condition ahead of winter? Crewcut’s operations manager Pauli Horgan says that as the days get shorter and wetter, it’s a good idea to keep grass long so that it can soak up some rays, and to do your lawn a favour by letting air in to dry it out. He says a trap for young players is to cut off long summer lawn in one fell swoop at the end of the season. This makes sense – imagine if you were enjoying a late summer nap outside when someone simultaneously turned off the sun and stole your clothes. It would be a horrible shock to the system. Get yourself a stiff rake and go over any dry patches, to weed out the dead grass. Grass needs mowing less over Autumn because of the weakening sun but it does need to convert all the energy it does get into growth – there’s none to spare for dead weight. Pauli advises grooming and caring for the lawn to ready it for winter hibernation. Depending on where in the country you live, you will have to watch out for sogginess, frost and suffocation. The last applies to lawns nationwide, so don’t put that rake away even if you’re not doing any lawn mowing. So even if your lawn mowing schedule drops back to two or three weekly, keeping on top of garden clearing is just as important to the health and appearance of your lawn. Blowing and raking leaves off the lawn also removes dead grass and gives your lawn maximum exposure to the sun. (And who doesn’t love having some fun with the leaf blower? Just make sure you herd the leaves into a green bag). From Northland to Southland, no part of the country is now immune to extreme weather and its likely many of you will have a bog at your back door at some stage over the next few months. Aeration is the practice of jabbing short narrow holes into the soil that provide channels for the air, fertiliser, rain and water to get through. This applies to water that might otherwise run off and not be absorbed into the ground, particularly if you have clay soil, advises Pauli. Rather than have your daughter’s rugby team go hell for leather on your turf, call your local Crewcut team. They are less busy with lawn mowing over the cooler months and happy to help with any gardening advice. Need garden help from a Crewcut operator? The lawn is going to need feeding ahead of the barren winter months and Pauli is a big proponent of including fertilising in his Autumn lawn mowing regime. The solution he advocates is a simple yet sustainable one. A new unauthorised biography of Prince Charles claims he has four gardeners who “lie flat, face down, on a trailer pulled by a slow-moving Land Rover” to hand pluck weeds, because of our future king's hatred of pesticides. If you too dislike pesticides but are on a lower budget, your lawn will love to be rid of energy sapping, eyesore weeds that you could pull yourself or call in a Crewcut gardener. It’s quite likely that you’ll also need to do some patching. Ensure you get the correct seed by taking a photograph of your lawn to the garden shop and asking an expert. Do not plant just before heavy rain (wash away) and do sprinkle top soil over the top and water daily for the first two or three weeks. So, while serious lawn mowing takes a back seat from now until Spring, lawn maintenance is more important now than ever. After all, it’s when one’s vulnerable that one needs TLC and your lawn will need to be in its best possible health to face a hostile Winter and emerge strong again in Spring. Try not to forget about your lawn during those cold dark weeks ahead when you see it less and less, because it is suffering out there! Ultimately, grass is a plant and like any other it needs love and attention. Autumn in the garden can be a dismal time. The food supply is dwindling, the lawn is soggy and when you gaze upon your domestic forest you’re faced with the full trifecta. There's summer overgrowth, a shaggy orchard and the resident maple dropping its leaves in the guttering. Tree pruning is necessary to keep nature in check and ensure the garden is a safe place. Untamed or diseased trees will not only fail to flourish or bear good fruit, they can be a real health hazard to humans. Branches that are overgrown or weakened by disease can take an eye out or crush a person. Remember to be sensible and call in the experts if a tree pruning job is too big. Don’t be shy about cutting back your dried out dead hydrangeas now: leaves, stalks and all. They will bounce back with new growth next spring. Trim into shape sun-loving shrubs that prefer to hibernate over winter and won’t fancy their snooze being disturbed by a nasty haircut. This includes lavender and rosemary. Deadhead your roses but wait until winter before you do any pruning – any new growth will suffer in the winter cold. (However, if you live in the north and your climbing rose has exhibited runaway growth due to the hot wet summer, wait for flowering to finish and then you go for it!). With all flowering trees and shrubs, remember to cut at least 2cm-3cm above new bud growth, in a downward direction away from the new bud. The long, hot, wet summer means the Crewcut gardening team has been overwhelmed with demand for a garden tidy up service. Jasmine, wisteria and other climbers are running riot, canes sprawling over the deck, garden and into the vegetable patch. In a couple of months deciduous vine leaves will be falling too fast for you to sweep up, so now is a great time for pruning trees that should be thinned out. Berry bushes – once finished, thin out to ensure bumper crops next season. Use secateurs to maintain control when you prune back tendrils to encourage fresh growth in spring. Remove spent branches, dead wood and unproductive ‘traffic’ clogging the main highways. When your stonefruit have finished bearing, it’s safe to pick up your loppers and start tree pruning. There are several things to consider before you start. First, the age of the tree – just like people, it’s best to shape trees from infancy. So, if you want to block the view of an ugly telephone pole, leave the central leader (trunk) and prune the lower branches. Prefer a low, spreading lemon tree that’s easy to harvest for cocktails? Remove the central leader to encourage sideways spread. This will form the tree’s future shape. Remember – you want the tree to put its energy into producing fruit, not sustaining extraneous growth, so don’t be shy about pruning away branches that are crowding the party. Tree pruning is trickier with saplings, but you must try to envision the future shape of the tree and imagine what it will look like with branches full grown. You don’t want to cut off a branch at the base if it will leave an ugly gaping hole in the eventual shape of the tree. There are some extraordinary hedges about at present – solid dark green boxes with metre-long pea green shoots waving wildly from the top. Crewcut has dedicated and experienced hedge trimmers but if you’re going to tackle these yourself, remember to put safety first. A stable ladder and preferably a second pair of hands to pass you equipment and keep the ladder steady. Check the underside of your ladder’s feet for the state of the grip – it may need new rubber shoes. Don’t overstretch, get down regularly to move the ladder or set up a trestle. If you’ve a super thick yew, you might be tempted to walk and cut at the same time but this will likely result in a sprained ankle. Every winter, the country is subjected to increasingly violent weather events, resulting in loss of property and occasionally life. In January, a Rotorua woman died when a tree fell on her car and earlier this month in the Northeastern United States five people, aged six to 77, were killed by falling branches and trees during a two-day storm. Five people in one storm killed by trees! We can’t stress enough the need to ensure the safety of your family, property and passing pedestrians and motorists. Make tree pruning a priority before winter. Take a good look at each tree and if in doubt, have an expert come and assess your property for anything that might pose a safety hazard should a big storm hit. It’s better to be safe than sorry so take it out or lop it off. Two children in the US were actually inside their homes when trees fell through the walls. Trees near the street and out on the berm should also be inspected for signs of rot and your local council notified if necessary. The hot, wet spells in summer that give us wonderful vegetable harvests have the flipside of fostering rot and disease. In the past, nature evolved together with the weather. Now, climate change has thrown it out of kilter and it’s struggling to establish its defences. Finally, before you go outside, remember the first rule of tree pruning – safety first. Protect yourself against falls, cuts and eye injuries and call on your Crewcut team for advice or assistance any time. The onset of cooler temperatures is the opening of a starting gate for gardeners champing at the bit indoors, clutching their forks and trowels. Previously limited to moonlit watering, they let loose attacking the weeds and bugs and carry everywhere their lists of tasks and plans. At this time of year there is plenty of vegetable gardening to do, but not much in the way of instant reward. Most Autumn gardening involves either cleaning up after the last harvest of summer or tending winter seedlings that won’t deliver for the table for weeks or months. In between is a great deal of weeding and lugging about of compost. You can get a lot of fun from planning your winter garden, sketching it out on paper, trying new varieties of vegetable and deciding which to sow in the greenhouse and which to plant straight from seedlings bought from the garden centre. 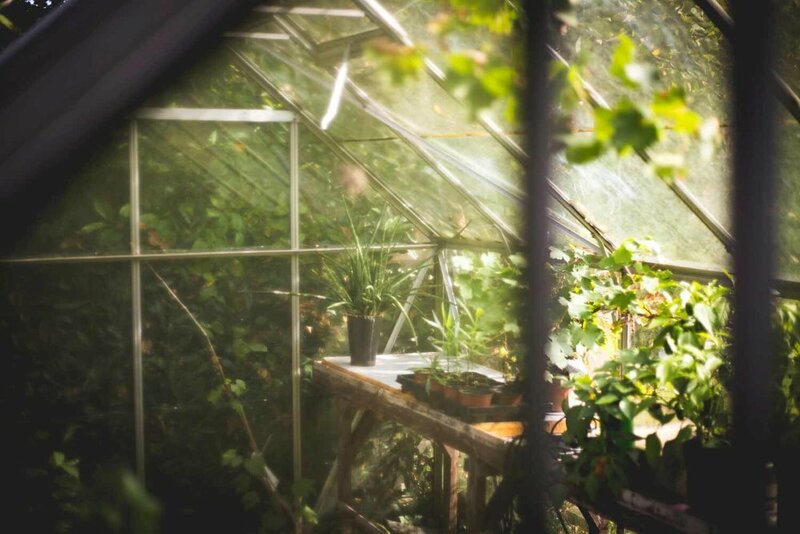 A greenhouse can be just a two-shelf number with a plastic cover from the hardware shop. Growing your own seeds is very satisfying – just remember that one seed sometimes means one vegetable (broccoli) and sometimes one plant (beans) and sow accordingly! Seedlings also make great gifts. Remember to wear gloves and a mask when opening bags of bought potting mix, because of risk of legionnaire’s disease. Airborne bacteria from the soil can cause lung infection. Stock up on neem oil, a natural solution to battling most bugs that love your vegetables. Downy mildew is a fungus that develops on the underside of the large leaves of cauliflower, broccoli and many other vegetables. It loves humidity – and loves Auckland! Most gardening suppliers have a product to combat it, you might even be able to find gardeners in Auckland to help you out. On a sunny day, go through your garden and pull out all dead vegetable plants and any that have gone to seed or bolted. Weed your beds and add compost. Practise green gardening by recycling - stakes and ties pass seasonally between tomatoes and beans, and 1.5l transparent plastic bottles (with labels and ends removed) encourage both celery and leeks to grow strong and tall. If you plan to give up vegetable gardening until salad days return (not unwise given how cheap winter vegetables are), then it’s tempting not to weed it at all. Cover the garden in newspaper (weigh it down) to choke weed growth and unveil at the end of winter. Much of vegetable gardening success comes down to composting and Autumn is the best time to get a new system started so it has time to decompose before it’s needed in early Spring. Once your household gets into the groove, composting becomes a way of life, plus it saves on rubbish collection fees. The best bin is the type with drawers at the bottom for easy access to the good stuff while you keep loading the goodies in the top. Keep the mix wet with the odd feeding from the hose and of course, throw in those grass clippings. If your garden is low on soil, then an all-purpose garden mix (and compost if you’re short) will bring the garden back to life again. Auckland Council is encouraging Aucklanders to reduce food waste and is offering free workshops, online tutorials and discounts on worm farms, compost bins and bokashi systems – find out more here. There’s even a food scraps/compost matching service, kind of Tinder for fertiliser? While you’re in the vegetable garden, check on the health of your herbs. Basil won’t be happy about the cooler weather, so bring him inside. Likewise, any houseplants that have been holidaying in the sun – peace lilies should come back in now and any tropical pot plants. Not all autumn gardening is dull! Here at Crewcut, we love bulbs because they’re hardy, self-sufficient and they set off a lawn to perfection. It’s wonderful after a grim winter to suddenly see the first merry daffodil faces, followed by beautiful tulips, elegant irises and cruisy colourful freesias. Planning this display is masses of fun and helps take the edge off the upcoming cold season. Some bulbs are high maintenance, so if time-consuming gardening maintenance isn’t your thing, best avoid hyacinths. Try framing the sunny end of your lawn with masses of daffodils or clumps of tulips, set little crocuses in and around a rockery or along a path. Many freesias have a beautiful smell (check the pack) so plant near the house or in a patio pot. Garden centres are always well-stocked with bulbs, or order online from a nursery for more variety. New Zealand has several excellent, reliable bulb nurseries. Remember – when the flowering is over, wait until the leaves have died before disturbing the plant. The leaves are still collecting energy from the sun and storing it in the bulb for next year’s growth. Depending on the type of bulb, you can dig it up for storing in a dry place, or in some cases (daffodils, crocuses, freesias) leave bulbs in the ground to naturalise (wait for the leaves to brown before snipping off). Summer bulbs aren’t planted until spring – these include dahlias, begonias and gladioli. The pointy end is the stem and the messy, rough side is the root system. Plant pointy side up. Check fastenings on plants and trees such as beans and climbing roses. Make sure ties aren’t too tight or in a position that will hinder new lateral growth. Newly planted saplings, including hedges, will need support against strong winter winds so choose a stake size accordingly. If your deck or front steps are mossy, get them water blasted so they don’t become a slippery health hazard over winter. Do this now rather than waiting to do it in the cold and rain. Clear your section of junk (broken kids’ Christmas presents) and take it to the local recycling centre (tip). Spending all winter watching it rust on the lawn is just depressing on several levels. An exceptionally long, hot, wet summer has resulted in triffid-like tendrils all over the place and we’ve been inundated by SOS calls from hedge owners. There’s a lot of pruning that you can do with your secateurs to keep things tidy and in check. Look out for upcoming articles here for pruning advice. The hedge is nature and human working together to create the ideal wall – easy, cheap and environmentally friendly. With ongoing care, it can also be beautiful. But what else can be done aside from hedge trimming to give you the best hedge on the street? North Shore Crewcut operator, Larry, says that when it comes to ongoing care, there is no ‘best’ tree species for a hedge. If you want a low maintenance hedge, he suggests buxus as a good choice and says that, along with acmena and pittosporum, it’s very popular with Kiwis. Consider your needs are before you choose the trees. I wanted a fast-growing hedge to screen out the neighbour’s wall and I wanted a tree with light foliage that would be easy to prune and would not block out the light. Attractiveness was important because the hedge is near our front door and finally, my partner had insisted on a native. After much enjoyable research I chose pittosporum tenuifolium Wrinkle Blue, with a height after 5 years of three metres, although I’ll be keeping it at about two. I dug a trench rather than individual holes so that I could play with the distance spacings marked on a piece of string (also, it was a lot easier on the back!). This method meant I could lay fertiliser along the trench to be reached by future root growth, rather than just under the root ball. Because of the proximity of the wall I tossed in some small bits of scoria for drainage and scattered sheep pellets and fresh compost on top. Early and continual pruning of the branches at the back ensures the hedge won’t become congested against the wall. This strategy will be difficult to keep looking tidy if the trees have different growth rates and characteristics, however it can make for an interesting effect. I am actively hoping to incorporate an existing camellia into my new hedge. It’s at the end of the hedge line – I doubt it would have survived in a more central position. Camellia hedges are very popular, with sasanqua and hybrids the best for hedging (I have a japonica Roger Hall and it’s quite woody, with slow, straggly growth). “If It’s a flowering hedge then the best time to trim depends on when the hedge comes into flower,” says Larry. Sasanqua are winter bloomers, so early Spring is the time to get out the shears or call in a hedge trimming professional before the hedge launches into its annual growth spurt. Water well because they have shallow roots but since they are also prone to root rot from waterlogging, mulching is especially important. (If you’re a camellia fan, make a seasonal visit to the impressive forest at the Auckland Botanic Gardens). If your hedge is difficult to control, trim the trees twice yearly, in early spring and late summer. I keep a garden diary and it’s invaluable. Over winter, make a note of whereabouts your house becomes dark and gloomy due to lost light and which parts of the garden are dampest and sunless. Are they shaded by a wall of greenery? If so, you may wish to significantly cut back hedging in spring. Likewise, if you are planning to plant a hedge later this year, make a note of where your house gets its winter sun and don’t plant where it will be blocked. You’ll be glad you have the information. Although common advice is to prune deciduous hedges in winter when the trees are dormant, I detest gathering fallen leaves, so I trim in early Autumn. This isn’t limited to hedges – we have a leaf blower just to cope with the wisteria. A single morning spent carrying branches and green clippings to the garden bag is preferable to the misery of raking up leaves all Autumn. You know it makes sense. Have an enormous hedge, inherited from a previous owner? The kind that as a kid you had great fun making huts inside? Rampant real estate inflation has dramatically increased the cost per metre of property, but you can regain some of your precious section by cutting back heavily. We cut back our monster laurel hedge and salvaged enough space for a bike shed. Nothing brings a tear to your eye quicker than seeing your freshly planted garden trampled, or your neatly mowed lawns sporting fresh new holes. While your garden and lawns may have been your pride and joy, your dog evidently wasn’t happy with them and felt they needed some minor alterations. If you’re inclined to disagree, it’s time to take action. While a stern word and a sit-down chat aren’t going to stop that troublesome behaviour, some of these tips below might. Rather than leave your furry friend to their own devices in your backyard, why not take the time to go with them? The less time they spend on their own, the less likely they are to resort to destructive behaviour that requires a significant clean-up job. 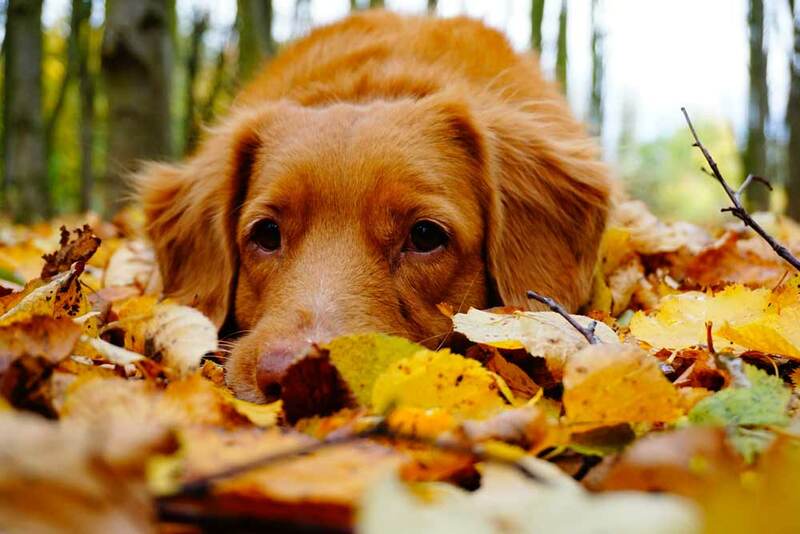 While dogs love being outside, they do have relatively short attention spans. Therefore, that fluffy tennis ball begins to look far less appealing than your gorgeous flower bed that’s lacking a bit of trampling courtesy of Rover. Take the time to play tug of war, throw a frisbee, play a game of fetch, anything that both stimulates your dog and stops it from adding new and unappreciated focal points in your yard. To protect your prized peonies from your destructive dog, it might be worth investing in fencing that acts as a deterrent. While the fencing doesn’t have to be six feet high, serving as a barricade, it can be a way in which to show your dog their intrusion into this area is not appreciated. Whether you had a gardener complete the work or you did it yourself, any method of protection is going to save you both money and time in the long run. Dogs require constant distraction, and you’ll soon learn what happens when you don’t. That’s when holes are dug in your freshly seeded lawns, and when garden beds become flattened. While you can hire experts to fix the problem, isn’t it best to avoid it in the first place? To distract a dog from causing havoc in your yard, be sure to exercise them every day. In most cases, a brisk stroll around the block won’t do. Trips to the dog park, ball games, and beach adventures are all valid ways in which to tucker out your pup and stop that destructive behaviour. After all, it’s not a naughty dog that sets out to trample the tulips; it’s a bored one. If emotions are running high because your previously immaculate lawn is looking like a battlefield, it’s time to try absolutely everything. If exercise, distraction, and fencing are not enough to stop your pup, then maybe home remedies are. Dogs are not fond of the smell of white vinegar. Therefore, you can use this dislike to your advantage. In your dog’s “hot zones” – the areas in which they tend to flex their destructive muscles, spray the area with vinegar. Alternatively, cayenne pepper is equally as beneficial if your pup tends to dig in the same spots over and over again. A smattering of cayenne pepper from your spice rack can often be enough to have them opting for “tamer” hobbies such as chew toys. While there’s no denying that man’s best friend loves to roll around in the grass and enjoy the fresh air, they might not have enough stimulation in that space to keep them entertained for hours on end. So, instead, they make their own fun at the expensive of your beautiful gardens and lawns. If you find that stress, anxiety, or separation is not the cause of your dog’s destructive behaviour, but boredom is, then creating their own area in the backyard can help to at least partly solve the problem. Offer plenty of toys to play with and chew, or even tunnels to run through if they’re agile and active pups. To create a space just for them, you may like to take it one step further and attach them to a proximity lead. This lead system is a stake installed in the ground with a wire that’s available in various lengths. While your dog can still run around and enjoy themselves, they may be just that little bit too restricted to gain access to your gardens. Just remember that dogs are social creatures and alone time should be kept to a minimum. Your dog doesn’t set out to be naughty, even if it seems that way. However, even being compassionate to your dog’s anxiety, stress, or boredom doesn’t fix your now trampled lettuces. If you’re getting ready to contact the experts to recreate your garden or mow your lawns, then there’s no time like the present to begin altering that destructive behaviour. Avocados are very “on-trend” at the moment. They go beautifully with eggs on toast, on a bagel with olive oil and feta, or even just cut in half and eaten with a spoon! In fact, thumbing through the pages of any current magazine will just about bring up a new recipe for how to enjoy them every which way. However, given the price of them – anywhere between $4-7 each, you may just be looking to mortgage your house to satisfy that avo craving. Therefore, what’s the harm in trying to grow a tree? It could save you a fortune while uncovering a hidden green thumb. Many of our franchisees also enjoy running avocado orchards when they’re not gardening, tree trimming, or behind the mower. It can be a rewarding process, so why not read our how-to guide and grow a tree for yourself? The avocado has its roots back in south-central Mexico where it began life in 7,000 BC. However, in recent years, it was discovered that Incan mummies in Peru dating back to 750 BC were buried with what appeared to be avocado seeds. As early as 500 BC, avocados were cultivated in Mexico, but they were known as Persea Americana. Eventually, they became known as aquacate which, in English, became avocado. Avocados are now a staple of many South American diets, but they also feature heavily in the west as well. People consume them for breakfast, in guacamole, and even in desserts such as cheesecake or mousse. Here in New Zealand, not every part of the country is blessed with the ability to grow them. They grow beautifully in Northland, Auckland, Hawke’s Bay, Bay of Plenty and Gisborne, and some people have even had success gardening them in Golden Bay and Nelson as well. However, those in the deep south will have less luck due to the colder conditions. Even if you love gardening and are quite good at it, you may still struggle to grow an avocado tree – depending on your conditions and where you live. You need to have protection from the wind, as well as a warm and sunny spot in your yard. What’s more, you must have at least two metres of free-draining soil due to the sensitive roots. You can grow avocado trees in coastal locations due to their salt tolerance, but even the slightest hint of frost will have them withering up and dying. A light frost will burn young growth, while temperatures as low as -3 degrees will kill young trees. Growing an avocado tree from seed can give you a sense of pride, even if you’re waiting 15 years to enjoy the fruits of your labour. The next time you get out a personal loan and buy an avocado, keep the seed. Here’s what to do with it. Wash it and pierce it with three evenly-placed toothpicks. Fill a glass with water and put the avocado on top with the bottom half in the water and the top half dry. The toothpicks will keep it in place. Place the glass in a warm area but not in direct sunlight. Wait. Roots and a stem will begin to grow and when they are 6-7 inches long, cut them back to three inches. When the stems have leaves again, and the roots are thick, plant them in fertile soil with half of the seed exposed. Water it but don’t drown it. Keep it in partial sunlight. When the stem grows to around 12 inches, cut it to half the height to encourage new shoots. Once the sapling has outgrown its pot, get your gardening gloves out and plant it outside in good sunlight. You don’t need to plant this shallow-rooted plant too deeply. To literally enjoy the fruits of your labour, you are in for between five and 13 years of waiting. After maturing at around five years old, you may see as much as 200 to 300 avocados per year. If you don’t want to wait over a decade to enjoy an avocado and salmon bagel, then you can opt for a faster method. Instead of growing the tree from seed, you can buy a pre-grown tree from a reputable garden product supplier. Then, instead of having to painstakingly fight to keep it alive, you merely have to carry out tree trimming to keep it in tip-top shape. It might take a few years for it to produce fruit, but it’s better than risking a 15-year wait. Not everyone is a gardening expert, and that’s okay. There are plenty around who can help you out when you require it. If you want your avocado tree to produce fruit and thrive for many years to come, then it’s crucial to stay on top of your tree trimming requirements – generally in Spring. If you believe you can tackle the task on your own, here’s how to keep your avo tree in tip-top shape. Remove damaged, dead, or diseased parts. Remove crossing branches or any part of the tree that may cause it not to grow as it should. Tip: Never remove more than 20 percent of the tree at any one time. If you haven’t carried out tree trimming on your avocado tree in some time, it may take several years for you to bring it back to its former self. It’s clear to see that to get that coveted avocado, you need to be willing to put in the hard yards. Otherwise, you may end up like the several thousand New Zealanders who put on a brave face as they buy a $7 avocado from the supermarket. Learning how to mulch can provide no end of benefit to the avid gardener. 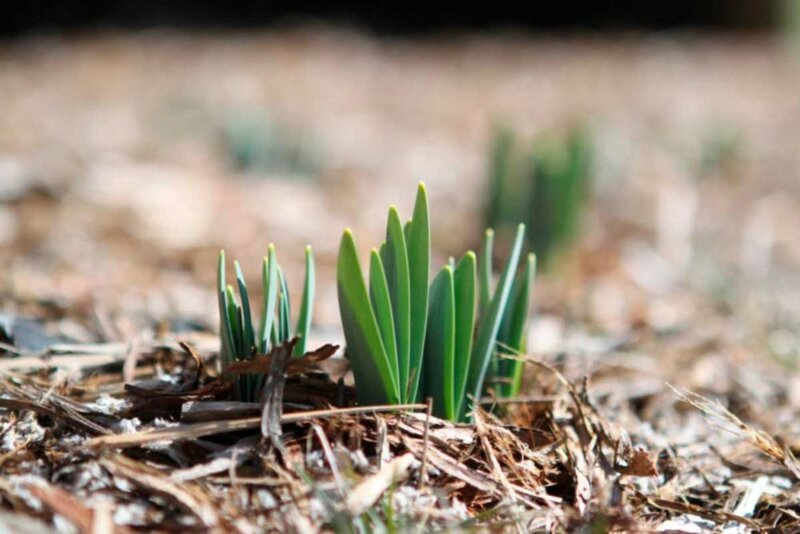 Not only does the mulching process help to stop frostbite and retain moisture, but it can be so beneficial for plant growth while preventing weed growth at the same time. If you’re tired of spending all your precious free time on weekends on your knees pulling out weeds, then while not learn how to mulch? We’ve included various options as well as the benefits of mulching below. Once you try out these methods, you will be surprised at how well your garden thrives as a result. 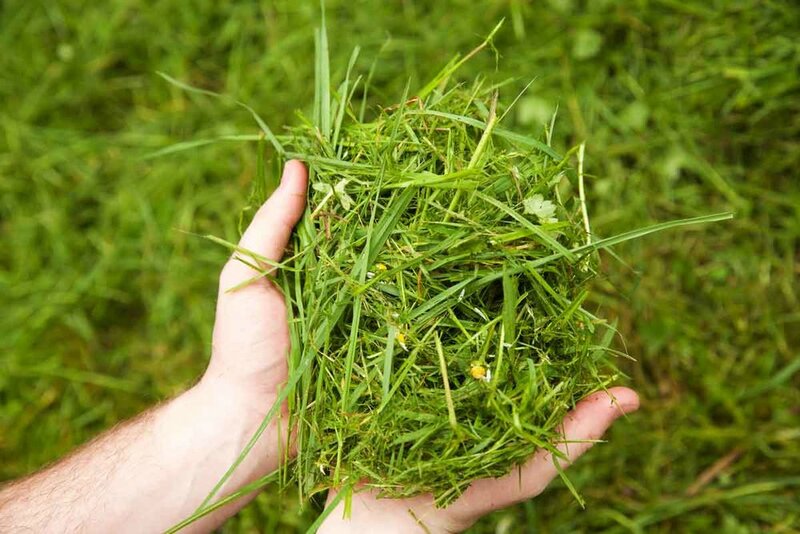 If you are always out and about mowing your lawns, then you will no doubt have plenty of lawn clippings available. Rather than pay to take these to a waste disposal facility or pile them in the corner of the yard, why not use them to your advantage? Grass clippings, believe it or not, are perfect for mulching. Just spread them over your garden beds to help with suppressing the growth of weeds. The best part is, they’re free. Given the water content, however, you will find they decompose reasonably quickly. If you have a considerable amount of lawn clippings, this may not be a problem for you. When you have finished catching up on the daily news in your local newspaper, you will find there are many benefits of mulching with it as well. Rather than throw it in the bin, you can layer the sheets around your favourite plants and help to keep the weeds away and your plants moist. For best effect, layer between four and eight sheets around your plants then wet them. Keeping them moist can help to stop them blowing away in the wind as well. When you’re learning how to mulch, or you’re getting gardening help from an expert; you will soon realise that bark is one of the most effective mulching products around. You can use it with your shrubs, encompassing garden beds, and even around trees. The reason why there are so many benefits of mulching with bark is that it’s long-lasting. Unlike lawn clippings and newspaper, it lasts a long time, meaning you can spend less time maintaining your garden and more time admiring it. However, if you like to dabble in transplanting, moving plants, and creating space for new plants, bark may not be the best mulching product for you. It doesn’t play nice with soil, making it exceptionally difficult to remove without interrupting the dirt. Most yards will have one or two trees that drop leaves in autumn and winter. While they are perfect for blocking your gutters and messing your entrance ways, they actually have a positive purpose – mulching. By collecting these leaves, you solve two problems – your plants get crucial nutrients, and your yard benefits from a clean-up. You can use shredded leaves anywhere for mulching, and they even encourage earthworms to work their magic as well. As a result, they help both your plants and your soil – while being free for the average homeowner. Straw and hay, when you use it correctly and know how to mulch correctly, can be exceptionally beneficial for your garden. However, you do need to be careful and make sure you purchase weed-free hay. Otherwise, you’re creating more problems than you’re solving. Weed-free hay can keep your weeds at bay, retain that all-important moisture in your soil, and add organic matter as well. When you add straw or hay for mulching, be sure not to pile it around roots, stems, or tree trunks. Piles of hay is an open invitation for slugs and rodents to come out and play. In a world that’s actively trying to promote less plastic use, it may seem odd that it can be beneficial for your garden – particularly as it doesn’t break down. However, if you have any old black plastic sheets lying in your back shed, you may as well re-use it rather than throw it into landfill. When you spread black plastic sheets tightly over a flat soil area, the sun’s heat transmits with it and creates a hive of activity within your soil. The soil warms up and then prevents weeds from growing, retains much-needed moisture, and even helps vining crops from succumbing to rot and dirtiness. If you have infrared plastic at home, then even better. This type of plastic can also help to produce better fruit crop yields. However, there is a right and wrong way to plastic use. You need to spread it out tightly over the top of your flat soil base, poke holes in it, then plant seeds in those holes. It may be hard to water those plants – especially in their early days, so you may also like to install drip hoses to help keep it moist while they grow. Plastic is beneficial for garden beds, but you shouldn’t use it for mulching under shrubs. It can, in a word, choke the plants as they begin to grow roots closer to the surface. In essence, there are no benefits of mulching with plastic for more mature plants. There is a common misconception that mulching during winter is not necessary because the sun isn’t out to heat up the soil for the best effect. However, mulching protects your plants from frostbite, so mulching in winter is a good idea. It stops the roots from freezing while preparing it for a hit of growth in the spring months. If you know mulching is essential, but you’re not sure how to approach it, you will find there are plenty of garden and lawn experts you can contact in your local area who are only too willing to help. There are also many benefits of mulching, so there’s no time like the present to arm yourself with newspaper, bark, plastic, leaves, or straw and hay and start the process today.